Tim Cook is set to speak at the Goldman Sachs Technology and Internet Conference today, set to begin shortly at 12:30PM PST/3:30PM EST. The presentation will be live streamed via an audio webcast, which you can listen in on here. 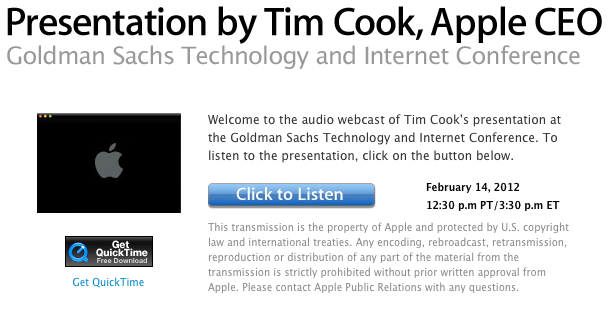 Welcome to the audio webcast of Tim Cook’s presentation at the Goldman Sachs Technology and Internet Conference. To listen to the presentation, click on the button below. 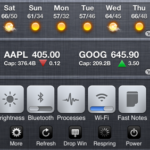 Tim Cook has presented before at the conference in 2007, 2008, and 2010, and normally shares tidbits on Apple’s business strategy. It will definitely be an interesting presentation to listen in on, as this time around he’s the CEO of Apple.